This one is perfect for collecting and preserving leaves and flowers on nature walks. 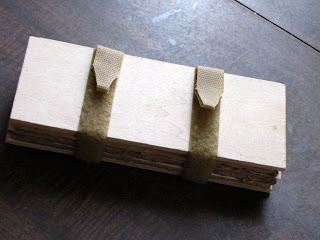 You'll need two thin pieces of wood in a convenient-for-toting size (can be found at the craft store if you don't want to saw and sand them yourself), non-adhesive velcro (inch to one and-a-half should do it), two rings that will fit your velcro (they can be found in the belt-making section of a cloth shop), cardboard, and acid-free paper. note: if you can find square or rectangular clips for securing, that would be better. I just couldn't find any. You can also use key rings, if you're in a pinch. 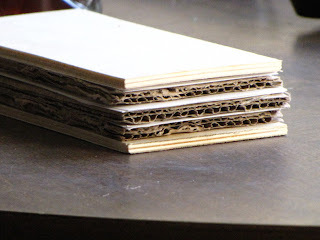 Cut your paper and cardboard the same size as your pieces of wood. 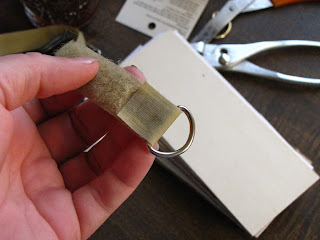 Next take the soft fuzzy piece of your velcro, and wrap it through the flat side of your ring, and hot glue it down, fuzzy to fuzzy. 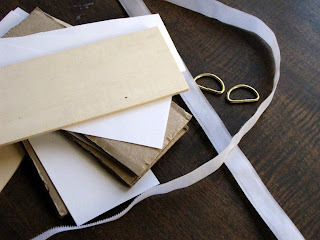 Wrap this piece around the smaller width of your cardboard, paper, and wood stack. 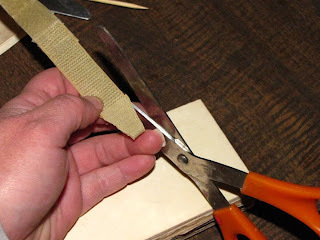 Cut the soft velcro piece 2-3 inches longer than the width of your stack. 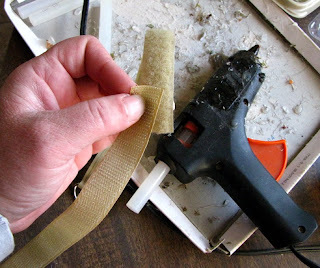 Take the stiff piece of velcro, and hot glue it to the last inch of your soft strip - so that both pieces of velcro are facing up. Now you have a longer piece, with the stiff part attached to the soft piece. 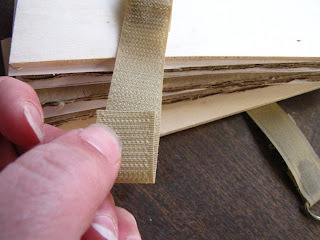 Depending on the width of your boards, cut the velcro 5-6 inches past where it's joined to the soft velcro. If you have a wide press, then 6 inches will do. 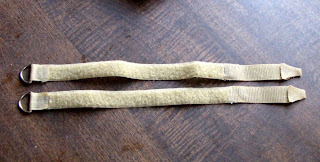 An inch away from the end (where the velcro is stiff, and where you've just cut) fold the stiff (poky) end back onto itself, so that your fingers are toughing the flat side of the velcro. Cut it so that it comes to a blunt point. Open your point back up and apply hot glue, and press the velcro to itself to match your cuts. Your pieces should now look like this. Place your rings on the top of your stack, fuzzy side up, and wrap it around the stack. Bring the end through the ring, and pull it back in the opposite direction to secure your press. The bottom should look like this, and your have tabs for easily releasing the press. 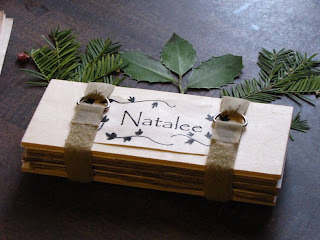 Make a pretty card with craft ideas, or a pleasant label, if you like. The press can also be painted or decorated however the Owner chooses. I love this. We made one that uses bolts and wing nuts, but it can be difficult to pull apart and line back up. This seems much easier. I almost said "It's a cinch!" :) but I am, as you can see, refraining! 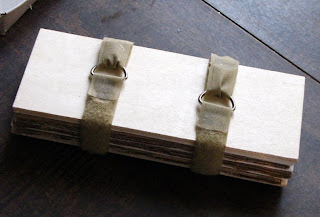 Ours uses bolts and wing nuts as well, so I think I'll switch it to these straps. Another great idea!